Amazing promo fares from Philippine Airlines! Grab the PAL Ultimate seat sale 2018 international routes! Book or buy Philippine Airlines promos from November 6- 19, 2017 and enjoy up to 70% discount from international destinations to the Philippines. Fares are good for roundtrip but do not include Philippine travel tax. This Philippine Airlines promos are available for trips to Manila, Cebu and other Asian cities. However, we shared only PAL sale tickets to Philippine routes. 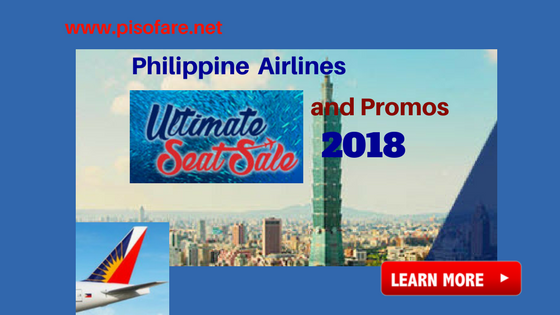 “Philippine Airlines Ultimate Sale” travel dates: January 16 until September 30, 2018. PAL promo tickets have limited availability and on a first come, first serve basis. Shared below are Philippine Airlines International Promo. Quoted fares are ALL-IN Roundtrip Economy Promo Fare. PAL sale tickets are quoted in different currencies. You may convert the fares to Philippine Peso or to USD. To avail the promo, book your flights at PAL website: www.philippineairlines.com or book a tour package at swingaround.philippines.com. You may also buy tickets at any PAL ticket office or from your favorite travel agent. Calling the PAL Reservation Numbers would be another way of booking the PAL promo fares. Check the List of Philippine Airlines Ticket Offices in Manila, Luzon, Visayas , Mindanao. PAL promo tickets issued online or outside the Philippines do not include Philippine Travel Tax. PH travel tax shall be paid before departure at the airport. Quoted ticket prices do not include government taxes, fees and surcharges. Baggage allowance: includes free 7 kilos cabin baggage. Free checked baggage allowance varies per route. Fares are non-refundable and cannot be rebooked on the same fare. Upgrade to the next higher fare is permitted subject to charges. There is no child discount on this sale; infant’s fare below 2 years without seat is 20% of adult ticket rate. With 50% mileage accrual for economy and 125% for Business Class. Want to avail the PAL promo fares? Then, book online or visit the nearest Philippine Airlines ticketing office starting November 6, 2017. For more promo fares updates of Philippine Airlines, Cebu Pacific, Air Asia and other airlines, LIKE us in Facebook: PISO FARE TICKET!! !